Orthodontic treatment is applied to make your teeth damage free, providing you a better and healthy smile with which you can carry your confidence in office, among friends, on a date or anywhere. With the help of your dentists, you may be able to analyse if you are really suffering from any kind of periodontal disease and need the orthodontic treatment. 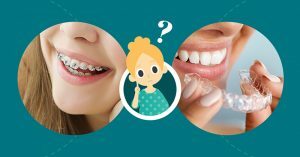 But there are some dilemmas in the mind of some people regarding the orthodontic treatment that has given birth to some myths which people often consider and hence avoid the treatment. Here we are talking about 7 major myths about orthodontic treatment that should better get avoided by people. Companies and local merchants who sell you or provide cheaper braces or aligners are actually not the certified orthodontists. They are only excelling their business in dealing with braces and aligners and it is advised to all of you not to get fooled by these people, considering them as an orthodontist and allowing them to relocate your tooth or experiment with your jaw area. Only those who have practiced dental surgery and have been trained at any standard institution associated with AAO, can be regarded as orthodontists. So next time when you visit any so called orthodontist, just verify if he is AAO certified or not. Not every orthodontic treatment is highly cost effective. It just depends on the complexity of your case. It also depends on how much time your treatment is taking. If your treatment is completed within a week, it’s going to cost cheaper whereas, if the process takes more than 2 weeks, then the orthodontist may charge a significant amount. However, the orthodontists certified with AAO work for the welfare of people and offer you free consultations with flexible fee structure. If you think that you are going to have a complete treatment in a single visit, then you may be wrong except the case that you have a minor problem with your teeth as before going through the orthodontic treatment, it is necessary to analyse and detect the problem deeply. For that, you need to visit the dental care centre to let your orthodontist analyse the problem and then plan the whole treatment. You can have regular intervals in between the process steps but clinic visit gives you the finest idea of actually what is happening to your mouth and if you really need the treatment. Ohh Come On! It is the complexity of your case on which the healing process depends. It may take a week or more than a year in the most typical case. But one should never compare the ideal treatment with the short or temporary treatment given by the private doctors who consider this treatment as a business and guarantee to heal your damage in a very short span, giving your reasons to regret later. The certified orthodontists are experienced in their realm and will provide you right treatment. So jut trust them. The orthodontic treatment’s prime aim is to provide you comfort of chewing, biting or eating your meal with the help of properly balanced teeth set along with your jaw line. Besides this, it’s another aim is to provide you comfort while speaking that you may not have with unbalanced teeth set. When your teeth are healthy and properly placed; then only your smile can look beautiful and healthy. Hence the orthodontic treatment is not just based on the appearance to sooth the eyes of others but your dental and oral health. There are not just metal braces that are used in relocating the misplaced tooth or lining up the teeth according to the jaw. Orthodontists study about the movement of teeth for a fine course of time and hence they know better which appliances or tool is better to treat our teeth to have a beautiful, healthy and balanced smile. They don’t pressurise you to apply the method with which you are not comfortable. Instead they will offer you a wide range of materials and methods with which you are comfortable and can move on with the treatment. To achieve the best results, AAO certified orthodontists work with tools that are most efficient for your case. According to the survey done in 2014, approx. 1.5 million adults have gone through the orthodontic treatment by AAO orthodontists. It is definitely not a fact that only children need orthodontic treatment. Instead, it has been seen that adults are having more dental issues than kids and hence need orthodontic treatment to get a healthy jaw. So, these are the major myths ,mentioned above that prohibit the process of people getting proper treatment and that too by AAO certified orthodontists who can aid people with better case insight and experience without damaging your gum and in affordable prizes. So next time if you search for an orthodontists, make sure that you will have an AAO certified orthodontist.